My school is about to graduate its sixth class of students. In independent school years, it is a young institution. By comparison, some of the older schools in my area have been around for 173 years and 328 years- a few more than our 11. As a young school, we have had to be particularly concerned about the track record of our graduates. Sure, we want them to succeed, but we also need them to succeed. To the greater world, they are our markers of success. They are how outsiders view our track record in providing a college-preparatory education to the young people who pass through our doors. Out of this scenario was born an innovative college support program that is designed to maintain a connection with our graduates as they pursue their postsecondary studies. Here is how it works: Graduates from our school who decide to use the program meet with tutors (employees of the school) for one hour per week each semester they are enrolled in college. Meetings are conducted over Google-Hangouts which allow us to screen share, collaborate via the G-suite collection of apps, and maintain editing records over time. Meetings are approximately one hour in length and can cover a wide range of needs depending on what the student is working on. Each student has a primary coach who acts as their tutor for most sessions, and has further access to teachers at our school who have expertise in other subject areas as needed. The Number One Tool You Will Need In College Is Work Ethic. When Jimmy graduated from my school, he was not an incredible academic. He struggled with core writing skills, reading comprehension, and with making deeper connections between high-level ideas. While this may seem like a cocktail for failure, what Jimmy struggled with academically, he made up in perseverance. His relentless attitude pervaded all aspects of his approach to college learning. He studied harder and longer than the majority of his peers, staying up late to complete assignments nearly every week. While his friends went out on Friday and Saturday nights, he stayed in to read lengthy journal articles. He woke up early on Sundays to get to the library and met with the people at the writing center for countless hours. This approach led him to graduate when others doubted his success from the very beginning. Using Your Resources Will Set You Free. Many students do not realize that it is in the best interest of the college for them to graduate in a timely manner. As such, colleges often provide many resources for their students, many of which go untapped throughout their learning careers. Writing centers, peer, professional, and departmental tutoring, disability support centers, advisors, research librarians, and professors themselves often go unused by the average college student. Jimmy quickly learned the value of these resources, and they served him well throughout college. He used the librarians to help him access the complex landscape of library journal databases. He met with has advisor nearly every month. With this all-hands-on-deck approach, Jimmy leveraged his resources to offset the parts of learning he most struggled with. Furthermore, the additional guidance and assistance he gained through his work with the caring adults in his college community led him to gain strong advocacy skills and a strong understanding of what it means to successfully pursue institutional benchmarks. The Power Of Consistent 1:1 Tutoring Cannot Be Understated. One aspect of college that very few people talk about is the loneliness. Students leave their often close-knit high school communities to venture out into the crazy college world. They leave home, have to do their own laundry, are forced to make new friends, manage a new and unusual learning schedule, and do a lot more learning on their own. These are quite a few variables to bear for a barely-eighteen-year-old. What must be further pointed out here is the dramatic change in support mechanisms for the student. The teachers that they had trusted and learned from are now gone, as are their parents and former peers. This can easily lead to feelings of deep isolation and helplessness. This is where my biggest lesson has been learned. For Jimmy to take on the complexities of college-level learning while remaking his support structure would have been a significant challenge to take upon on his own, particularly for his early-level classes. Through our tutoring partnership, Jimmy was able to figure out how to be successful much more quickly. 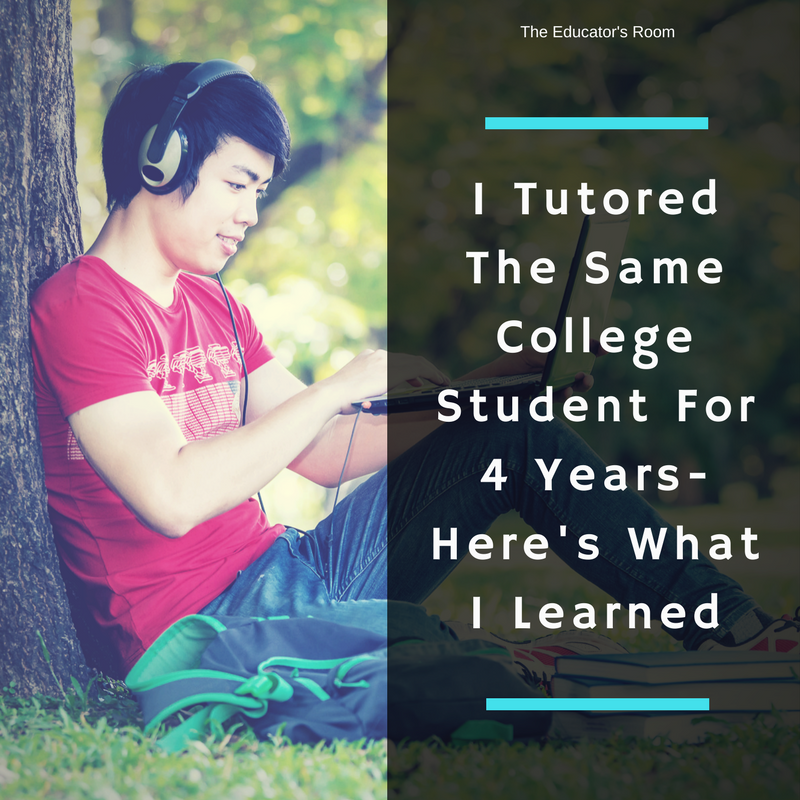 He was able to see the value of hard work early on and had a person to help him navigate through the various stages of the learning process. Both of these attributes, without a doubt, have paved the way to his graduation this weekend. Combined with my preparation time, extra hours during exams, and times in which we just chatted about life, Jimmy and I have spent around 400 hours together these past four years. I am honored to have helped him finish his Bachelor’s degree, and will be proud to watch him walk the stage in his cap and gown.